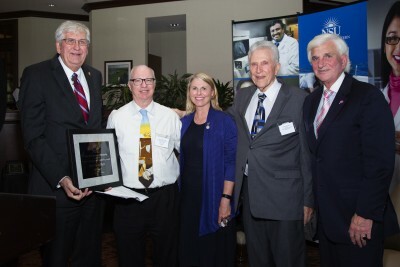 (left to right): Ralph V. Rogers Jr., Ph.D., NSU executive vice president and provost; Robert C. Speth, Ph.D., recipient of NSU’s 6th Annual Provost’s Research and Scholarship Award; Lisa Deziel, Pharm.D., Ph.D., dean, NSU College of Pharmacy; Stanley Cohen, Ed.D., nominator of Dr. Speth; and George L. Hanbury II, Ph.D., NSU president & CEO. FORT LAUDERDALE-DAVIE, Fla. – In recognition of his significant contributions to Nova Southeastern University (NSU), Robert C. Speth, Ph.D., was named the recipient of the Sixth Annual Provost’s Research and Scholarship Award. Dr. Speth is a researcher and professor of pharmaceutical sciences in NSU’s College of Pharmacy. Ralph V. Rogers Jr., Ph.D., NSU executive vice president and provost, made the special announcement at the university’s External Funding Recognition Reception, hosted by Gary S. Margules, Sc.D., NSU vice president of Research and Technology Transfer, at which faculty members from all disciplines across the university are recognized for their commitment to advancing their fields of study. The Provost’s Award honors a faculty member who has demonstrated significant achievement in support of NSU’s mission to foster scholarship, intellectual inquiry, and academic excellence. Research and scholarship are two of NSU’s eight core values, and excellence in these areas enhances education, patient care, and public service, and develops superior scholarship. Dr. Speth is widely recognized for his research on how angiotensin acts in the brain to regulate the cardiovascular system. In the course of his career, he has secured more than $1 million in funding for his research through 22 externally-funded projects. Dr. Speth is a regular contributor to a variety of national publications and has served or is currently serving on the editorial boards of prestigious journals, including Regulatory Peptides, the Journal of Pharmacology & Clinical Toxicology and the International Journal of Peptides. He has served as an ad-hoc reviewer for 39 journals, including Science. He has also served the field as a grant reviewer for organizations including the American Heart Association, National Institutes of Health and National Science Foundation. Dr. Speth manages to be a leader in the research field while also offering countless hours to teaching endeavors. In addition to his classroom commitments, he has mentored countless high-school, undergraduate and graduate students, along with junior faculty members, working with him in his lab on various projects. Dr. Speth and his wife, Janet, are Bronze members of NSU’s Fellows Society which recognizes individuals, corporations, and trusts who have made cumulative gifts of $100,000-$249,999. This demonstrates Dr. Speth’s investment in the advancement of NSU through the largest philanthropic campaign in its history, Realizing Potential, which aims to raise $250 million for student, faculty and 21st century education initiatives, with research integral to all three priorities. Dr. Speth has received multiple honors, including election as a fellow of the American Association for the Advancement of Science. He earned his Ph.D. in Pharmacology from Vanderbilt University in Nashville, Tennessee, his Master of Arts degree in Physiological Psychology from Connecticut College in New London, and his Bachelor of Arts degree in Biology and Psychology from Western Maryland College in Westminster (now McDaniel College). *Denotes titles and college names at the time the award was presented.